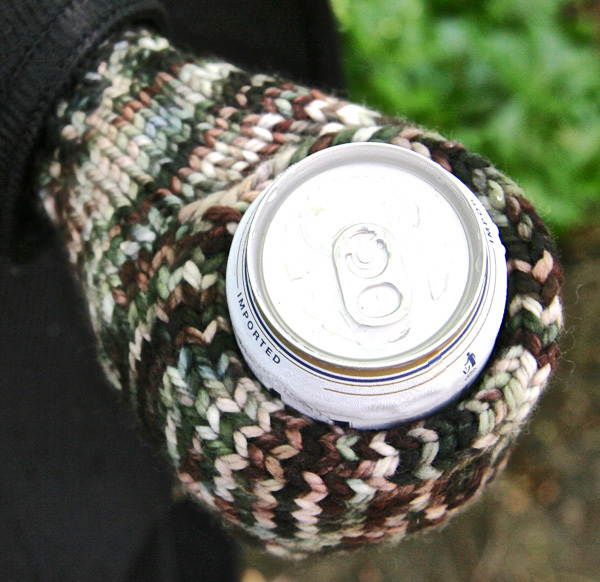 Inspired by a similar Icelandic accessory, meet the Beer Mitt! 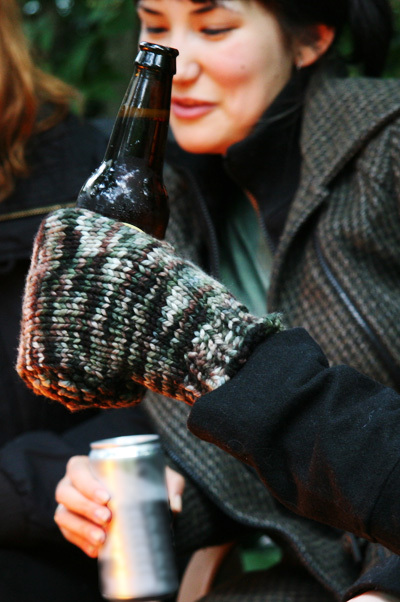 The perfect accessory for football games, backyard fire pits on chilly autumn evenings, or any other cool-weather beverage-drinking event. They start out as a tube with a provisional cast-on, then half the "tube" stitches are grafted to half of the provisionally cast-on stitches. The rest of the stitches are joined in the round and knit downward, ending with the ribbed cuff. This may seem complicated, but it's much simpler than it sounds. 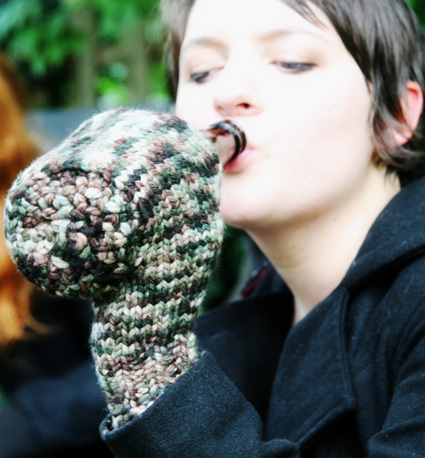 The pattern is written for three sizes: small (a "rootbeer mitt," to fit a child's hand), medium (to fit a typical lady-paw) and large (to fit a gnarly man-hand). The beverages you choose to imbibe are up to you! Provisionally CO 24[30, 36] sts. Distribute sts across needles as you prefer and join for working in the round. Work in St st (knit every rnd) for 10 inches. Unravel the first 12[15, 18] sts of the provisional CO and slip them on a spare needle. Fold piece in half and graft together the LAST 12[15, 18] sts of the rnd with the sts on the spare needle. Now unravel the remaining 12[15, 18] sts from the provisional CO and place them on your needles. 24[30, 36] sts. Distribute sts as you prefer and join for working in the round. Continue in St st until work measures 2[2.5, 3] inches from the graft, measuring along the side. Next rnd, sizes S & M only: (K2tog, k2[1, -]) around. 18[20, -] sts. Next rnd, size L only: (K2tog, k2) to last 4 sts; k2tog twice. 26 sts. Next rnd: [K1, p1] to end. Continue in ribbing as set for 2 inches. With bottom of mitt facing (the side closest to the beginning of the rnd), find the st closest to the graft on the outside of the mitt. Using crochet hook, work a single crochet into this st, and every other st all the way around the bottom of the mitt. Continue working a single crochet into every other st, forming a spiral, until no sts remain. Bind off. Weave in ends, using tails to close any gaps at the edge of the graft. Toby Roxane Barna is a 25-year-old independent knitwear designer living and working in the New York tristate area. 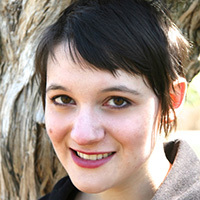 Having learned how to knit shortly after graduating from Sarah Lawrence College in 2009, she began working at a local yarn shop. She now runs her own business, Toby Roxane Designs, full time. Her patterns are available for sale on Ravelry and she is currently represented by Deep South Fibers.